Bishop George Ahr High School » News & Announcements » News » Thank You for Being Bold and Getting Cold! Thank You for Being Bold and Getting Cold! Thank you so very much to everyone who contributed, supported and volunteered to make the Polar Plunge a huge success this year! 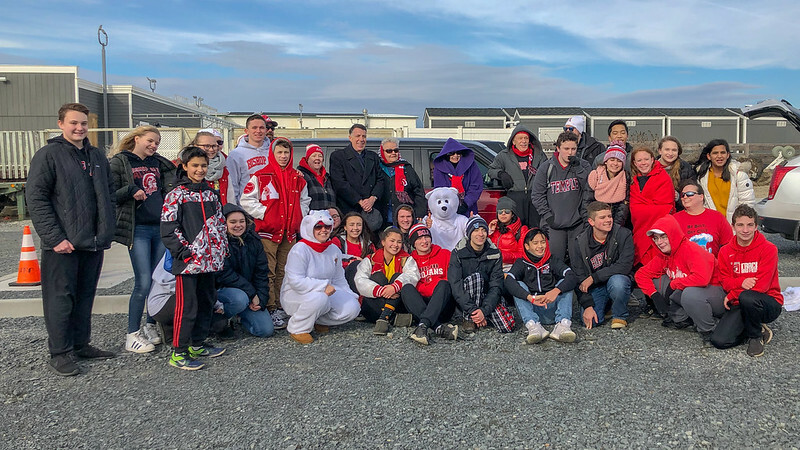 We kicked-off Catholic Schools Week by our participation in the Ancient Order of the Hibernians Polar Plunge event in Sea Bright, New Jersey, an annual AOH event designed to help Catholic schools raise funds. And Bishop Ahr took top honors this year by raising over $90,000! While the ocean water was a chilly 41 degrees, the air of excitement, enthusiasm and anticipation warmed the hearts of participants and supporters alike. "There was a real buzz in the air! It's great to see so many students, faculty members, alumni and parents turning out for the event!" said one eager participant. Indeed, Bishop Ahr set new school standards for the number of people "taking the plunge!" Moreover, His Eminence, Bishop James F. Checchio was "on the beach" supporting the school’s efforts. "All of the money raised will go to meet the needs of the various school projects like STEM, fine arts, school clubs as well as our athletic department, and we look forward to doing this all over again next year!” said Deborah Chippendale, Director of Development and Alumni Affairs for Bishop Ahr High School. The various contest winner will be announced next week as contributions are still coming in. Well done to all the winners! "We look forward to doing this all over again next year!"